The gallbladder is a small pear-shaped organ that acts as a storage tank for bile. 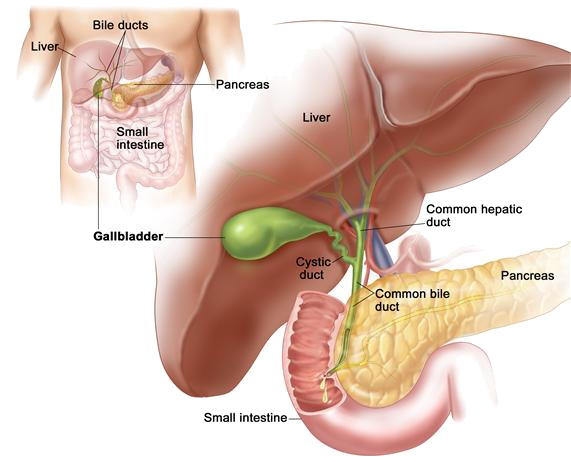 The bile is made in the liver by liver cells and is sent through tiny ducts or canals to the duodenum (small intestine) and to the gallbladder. The gallbladder stores the bile to have it available in larger quantities for secretion when a meal is eaten. The ingestion of food and especially fats cause the release of a hormone, which in turn signals the relaxation of the valve at the end of the common bile duct which lets the bile enter the small intestine. It also signals the contraction of the gallbladder which squirts the concentrated liquid bile into the small intestine where it helps with the emulsification or breakdown of fats in the meal. There are two surgical techniques used to remove the gallbladder. 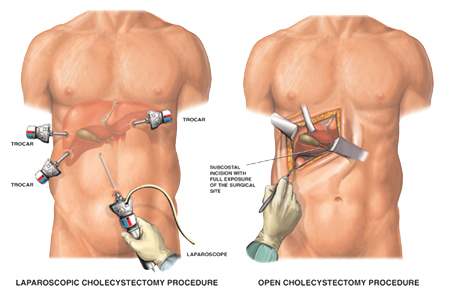 Laparoscopic cholecystectomy – your gallbladder is removed through small cuts in your abdomen (tummy), using a surgical technique called keyhole surgery. Open cholecystectomy – your gallbladder is removed through one large cut in your abdomen, using a surgical technique called open surgery. Your GP will ask you about your symptoms, and examine you. He or she may also ask you about your medical history. Your GP may press gently with his or her fingers over the right-hand side of your abdomen. This area may feel tender if your gallbladder is inflamed. What are the alternatives to gallbladder removal? If you have gallstones but they aren't causing any symptoms, or surgery to remove them isn't suitable for you, there may be alternative treatments. Sometimes gallstones can be dissolved using medicines, however gallstones often come back after this type of treatment and it is therefore rarely used. If gallstones are in your bile duct and not in your gallbladder, they can be removed during ERCP. An endoscope, which is guided using X-rays, is passed into your mouth and down to your bile duct. Special instruments can also be inserted inside the endoscope to allow your surgeon to remove the gallstones from your bile duct. ERCP can only be used to remove gallstones if they are found in your bile ducts. If gallstones are in your gallbladder itself, you may need gallbladder surgery as well. Your surgeon will discuss any possible alternative treatments with you. Your surgeon will explain how to prepare for your gallbladder removal. For example, if you smoke, you will be asked to stop as smoking increases your risk of getting a chest and wound infection, which can slow your recovery. Gallbladder removal using keyhole surgery is routinely done as a day-case procedure but you may also need to stay overnight in hospital. Gallbladder surgery is usually done under general anaesthesia. This means you will be asleep during your operation. If you're having general anaesthetic, you will be asked to follow fasting instructions. This means not eating or drinking, typically for about six hours beforehand. However, it's important to follow your surgeon's advice. At the hospital your nurse may check your heart rate, blood pressure and test your urine. Your surgeon will discuss with you what will happen before, during and after your procedure, and any pain you might have. This is your opportunity to understand what will happen, and you can help yourself by preparing questions to ask about the risks, benefits and any alternatives to the procedure. This will help you to be informed, so you can give your consent for the procedure to go ahead, which you may be asked to do so by signing a consent form. You may be asked to wear compression stockings to help prevent blood clots forming in the veins in your legs. You may need to have an injection of an anticlotting medicine called heparin as well as, or instead of, wearing compression stockings. What happens during gallbladder removal? Gallbladder removal is usually done using keyhole surgery, which means your surgeon won't have to make a large cut in your abdomen. Keyhole surgery to remove your gallbladder usually takes between 30 and 90 minutes. Your surgeon will usually make four small cuts in your abdomen. He or she will inflate your abdomen using harmless carbon dioxide gas to create space and to make it easier to see your internal organs. Your surgeon will then pass a laparoscope (a long, thin telescope with a light and camera lens at the tip) through one of the cuts to view your internal organs on a monitor. Your surgeon will then insert specially adapted surgical instruments through the other cuts so that he or she can remove your gallbladder. During the operation your surgeon may take X-rays to check there are no gallstones in the bile duct. At the end of the operation, the carbon dioxide gas is allowed to escape and the instruments are removed. Your surgeon will close the wounds with stitches or metal clips and cover them with a dressing. You may need to rest until the effects of the anaesthetic have passed. You may need pain relief to help with any discomfort as the anaesthetic wears off. If you're a day-case patient, you will usually be able to go home when you feel ready but you will need to arrange for someone to drive you home. Try to have a friend or relative with you for the first 24 hours after your surgery. Before you go home your nurse will give you some advice about caring for your healing wounds. You may be given a date for a follow-up appointment. General anaesthesia temporarily affects your co-ordination and reasoning skills, so you must not drive, drink alcohol, operate machinery or sign legal documents for 24 hours afterwards. If you're in any doubt about driving, contact your motor insurer so that you're aware of their recommendations, and always follow your surgeon's advice. If your wounds are closed with metal clips or stitches, these will be removed by a nurse after about a week. Commonly, dissolvable stitches are used with this procedure. The length of time your dissolvable stitches will take to disappear depends on what type you have. However, for this procedure they should disappear in about two weeks. Once your gallbladder has been removed, your body can't develop new gallstones. However, if gallstones have passed into your bile ducts and remain there after surgery, you may still get symptoms. 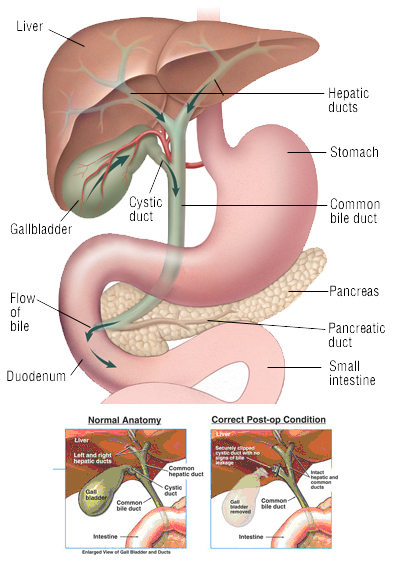 Gallstones that have passed into your bile ducts can be removed by ERCP. Most patients are well enough to go home on the same day and this is actively encouraged as an uncomplicated procedure often means that recovery is more comfortable at home. In rare circumstances patients may have to stay overnight for pain control or due to the procedure being complicated or converted to open surgery. It usually takes between one or two weeks to make a full recovery from keyhole surgery to remove your gallbladder, but this varies between individuals, so it's important to follow your surgeon's advice. If you need pain relief, you can take over-the-counter painkillers such as paracetamol or ibuprofen. Always read the patient information leaflet that comes with your medicine and if you have any questions, ask your pharmacist for advice. Your surgeon may give you painkillers when you're discharged from hospital. As with every procedure, there are some risks associated with gallbladder removal. We have not included the chance of these happening as they are specific to you and differ for every person. Ask your surgeon to explain how these risks apply to you. Side-effects are the unwanted but mostly temporary effects you may get after having the procedure. Complications are when problems occur during or after the procedure. The possible complications of any procedure include an unexpected reaction to the anaesthetic, excessive bleeding or developing a blood clot, usually in a vein in the leg (deep vein thrombosis, DVT). There is a chance that during the operation your surgeon may need to convert from a keyhole procedure to open surgery. He or she will need to make a bigger cut in your abdomen. This will only be done if it’s not possible to complete your operation safely using the keyhole technique. It’s likely to take you longer to recover from this type of surgery than keyhole surgery, and you may need to spend more time in hospital. BEFORE THE SURGERY IF YOU HAVE ANY HEART, LUNG OR KIDNEY PROBLEMS OR TAKE MULTIPLE MEDICATIONS INCLUDING ANTICLOTTING OR BLOOD THINNING MEDICATIONS OR HAVE HAD MAJOR ABDOMINAL SURGERY BEFORE PLEASE MAKE SURE THAT YOU HAVE HIGHLIGHTED THIS TO THE SURGICAL TEAM. ALSO PLEASE REMEMBER THAT THE DAY OF YOUR SURGERY YOU SHOULD NOT HAVE HAD ANY CHEWING GUM OR ANYTHING TO EAT OR DRINK FOR AT LEAST 4 HOURS BEFORE YOUR ARRIVAL TO HOSPITAL. Risks for patient to read and initial that they understand the potential risks of this surgery. Please note that complications from this very routine and usually day case surgery are rare, however it is our duty as a surgical unit to ensure that you the patient understand the potential risks of the proposed surgery above. Please therefore read and initial the information below regarding laparoscopic cholecystectomies. As well as the risks form below that you have to initial it is hospital policy to fill out a separate consent form for the surgery.